I used an old vintage drawer to create this project. 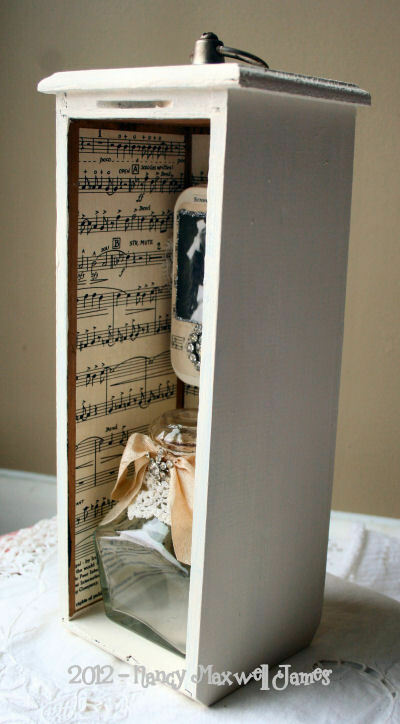 It was painted a shabby creamy white, and old sheet music was added to the interior. 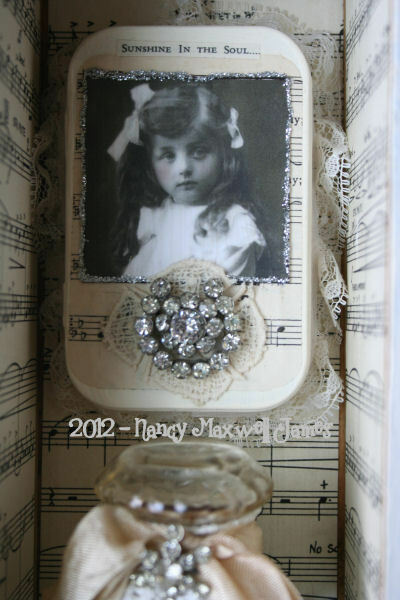 I added an altered tin with bits of vintage lace and a sweet rhinestone pin. The darling face is from Paper Whimsy. The old vintage bottle has lace and another rhinestone jewelry bit added and seam binding around the bottle neck. Well darn !! Just saw a couple of these a while ago,didn’t buy them when nothing brilliant entered my brain. What a great idea and ever so cute Nancy…….now where did I see them?? Gorgeous! Such a unique and beautiful piece. Nancy, just love this drawer and all the divine embellishments! Shabby Chic never looked so good. Happy Weekend! My dear Nancy, how lovely, and how sweet. 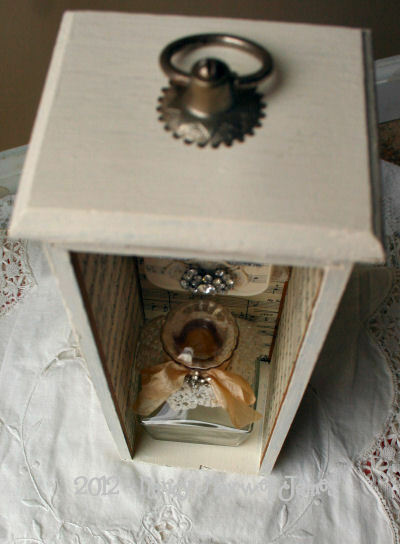 Your tin looks so beautiful in there, with the bottle, and the drawer is just wonderful in that sice., I love you also used a bit bling with all the cream and white. A gorgeous creation sweet friend. This is another piece of creative work from an old vintage drawer- bringing to it a new life with a very pretty image and decorated bottle! 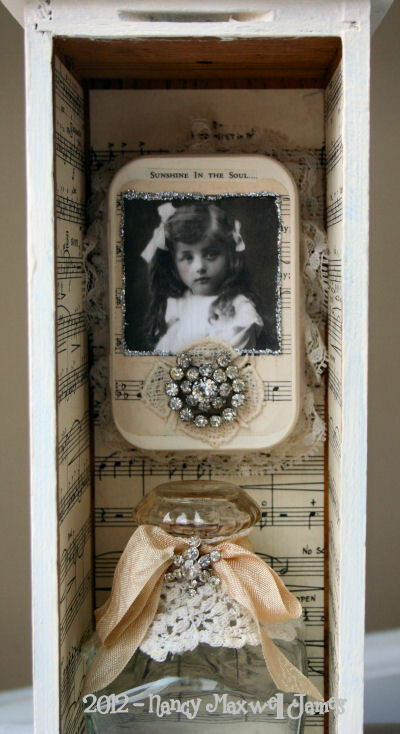 I love the sweet simplicity of this Nancy, it’s wonderful to use found items and create works of art. Woow…so beautiful with the vintage bottle! Lovely, lovely box Miss Nancy. Wonderful little details. I love it. what a great idea!! Love it!! So creative – love, love, love it! Oh, it’s great! It’s a wonderful idea! The pic, the little bottle, every detail is perfect. I’ts a very gorgeous piece, thanks for sharing! Major Fabulousity! You continue to amaze me with your talents. trying to catch up with you.Oh, I love the drawer – absolutely beautiful!Have a wonderful start of the week. You make the sweetest creations I have ever seen! Wow! I love how you work with nostalgic items and bring them a new expression! Beautifully inspired vintage project…love what you did with this drawer and the elements are perfect!